With the latest release of the Process Cloud Service (17.1.3), Oracle has released a preview version of its much awaited Decision Model and Notation (DMN) engine. The DMN standard provides a powerful meta-model, notation and semantics for modeling of operational decision and business rules. It is a critical addition in the process, case and decision modeling framework providing an open standard for modeling the data and logic associated within a process. The notation standard aims at defining requirements and decision logic for manual and automated decision-making by representing a complete, executable model which can either be used independently or in conjunction with a business process. 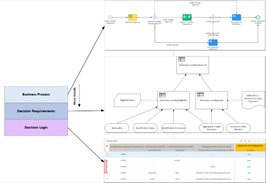 Similar to BPMN, it aims to support designing of decision models, providing guided operational decision and potentially automation of operational decisions. A combination of process and decision modeling simplifies business processes by eliminating and replacing sections of a process model with a decision model. The decision logic of the process model is captured as a separate, yet linked, model. By focusing on decisions and processes independently the requirements process is more focused. A decision-driven process acts on the outcome of the evaluation of decision logic in several possible ways, including: Read the complete article here.